Can anything be poetic in the politicking of Washington, D.C.? Is there poetry in the morning's headlines and in tonight's news tickers? Or, as Seely paraphrases Dr. Seuss, Do W's troubles trouble you, too? America's pundit poet laureate, the man who channeled the poetry of Donald Rumsfeld and Phil Rizzuto, now offers the perfect metaphor for the inside-the-beltway bubble: it's a nursery. Using the beneficent spirit of Mother Goose, he has fashioned hilarious nursery rhymes hidden amid the photo ops and filibustering. "John Kerry backed Iraq, John Kerry took it back," making him "a very airy, wary hara-kiri." Bill Bennett, "independent, Kept a hidden secret muse. He would clutch his lucky pendant, Praying, 'Papa needs new shoes '" As for Iraq, "When you lose, you lose, and when you win, you win, and when you can't tell win from lose, best stop the war you're in." 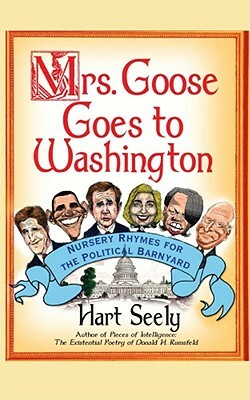 No one is safe from Seely's wicked muse: Hillary Clinton, John McCain, Barack Obama, Mitt Romney, virtually every news anchor, and a good portion of the Hollywood elite are skewered unforgettably by Seely's Mother Goosequills in this irreverent and hilarious collection.